Hi Christie. I would like to put together a female betta tank but I keep getting conflicting information on how big it should be and the number of girls you can keep together safely. I really don’t think I can afford anything bigger then a 10 gallon aquarium. Please help. A ten gallon is a good start for a “girl tank“, as those of us bettaholics call it. It’s large enough to cycle and to safely hold 3 female bettas, which is the minimum you would want to keep in an aquarium with multiple females. Certainly, one female is just fine too but we’re talking about a community set-up here. The reason you don’t want to keep two females together is because typically one will assume the dominant roll and act out aggressively toward the other. While less aggressive then the males, the females still tend to lash out. Keeping a three or more in a tank will ensure that the aggression is dispersed evenly lessening the possibility for severe injury. 1. Don’t overstock the tank. Bettas fight, even the girls, so don’t pack more then 3 in a 10 gallon. It’s better that they can find territories that they can call their own. 2. Do add lots of plants and hidey holes. Break up the sightlines so aggressive females aren’t always in view of the subordinates and so the weaker females feel secure. Brown thumb? Bettas don’t care if the plants are real or silk. You can try some driftwood or caves too. 3. Do have a contingency plan. Some females are just too aggressive for a community tank. Have a Plan B in place in the event that you have a real bully on your hand. This could be a spare tank, a friend or a local fish store that will take your female if she doesn’t play nice. i was just wondering what might happen if i put one of my male bettas in with the girls??? would they fight??? I did that a few days ago after getting a girl, BAD IDEA. I thought he wouldn’t bug her so much, but as it turned out the male was was too aggressive. After day 1, I already found the female with part of her fins ripped up, so I immediately put her into a separate tank. A male betta should only be put in the same tank as a female betta during spawning, then they must be put back in their separate tanks. I had a 10 gallon tank and had 5 girls successfully together. But keep in mind my tank was heavily planted and all the girls had been together since they were no bigger than an inch. There was a higherarchy, but no fins were nipped; only the occasional chase. NEVER put female and males together (unless spawning). If you have several females, do make sure they all get a chance to eat. If you have two, one will gorge herself on all the food and guard it from the weaker one. With 3 or more, there is less direct influence and there are generally enough distractions to prevent all the food from being hoarded by one female. Even if they are not hurting each other seriously you can end up starving out the bottom of the pecking order if you are not careful. 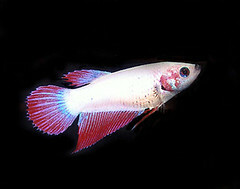 Can you put a single female betta into a peaceful community fish tank of 10 gallons?